October 19, 2018, West Palm Beach, Florida – Rosarian Academy opened its newly-constructed, hands-on learning environment, the STEM (Science, Technology, Engineering, and Mathematics) Innovation Center on the first day of the 2018-2019 school year in late August. Read more about the dedication of Rosarian's new STEM Center. The STEM lab offers 1,840 square feet of cutting-edge space for students to think, create, design, and solve problems. 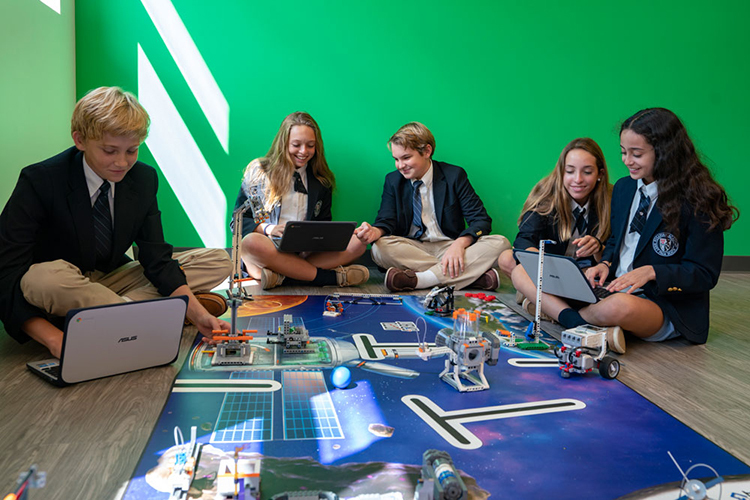 Stocked with a video green screen wall, 3-D printer, laser cutter, Lego EV3 robot kits, BeeBots, and much more, students and faculty are ready to embark on an innovative school year. Gabriele St. Martin, in her first year at Rosarian, will coordinate the STEM activities of the K-8 students, drawing on her 24 years of teaching experience, primarily as a middle-school science teacher. She incorporates project-based and problem-based learning into her classes and gives all students the opportunity to work with robotics and engage in the engineering process. This shared learning process and continuous curricular improvement is Rosarian’s commitment to preparing its students for any career path in the 21st century. Last Spring, Rosarian partnered with Carnegie Science Center as the first Carnegie STEM Excellence Pathway partner in Florida. The program is designed to help schools adopt best practices in STEM education. The Pathway is a process of continuous improvement that helps schools to strengthen their STEM programming. The pathway has attracted more than 4,600 participating schools or districts in 22 states and the District of Columbia, serving more than 1.5 million students. Fourth-grade students use Lego EV3s to build a robot that folds T-shirts.